Patiko LCIII Chairperson Magaret Arach Komakech hands a matress to one of the best 2017 PLE performers in Gulu on Friday. Gulu woman Member of Parliament Betty Aol Ocan has asked parents to be closer to their girl-child for them to excel in education and avoid early marriages and school dropouts. 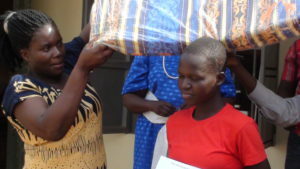 Ms Aol was giving mattresses and cash presents to pupils from Gulu District who performed well in the 2017 Primary Leaving Examinations (PLE), from her office on Ring Road, Pece division in Gulu Municipality on Friday. She appreciated the father of 12-year-old Catherine Acen, from Layibi Green Primary School who got Aggregate 7 in last year’s PLE exams for mentoring his girl to love education. Acen attributed her good performance to her father, Wilfred Nyeko, who has been close to her, inspiring her to become a civil engineer in future. “My Dad was very helpful in many ways when I was at school and he still supports me in many areas of my growth. I want to become a civil engineer like him when I finish school. He has taught me to work hard to have the best in life.” Says Acen. Nyeko says staying close to a girl-child helps close the gap girls experience when they grow into adolescent stage. “I want to know my girl and be her friend so that I can teach her the character and morals in our family. When she goes to school, she can know what to do.” Says Nyeko. Acen wants to join Sacred Heart Girls’ School in Gulu Municipality to continue with high school education. Gulu Woman MP, Betty Aol Ocan believes that if fathers play their role of being friends with their daughters, school drop out of the girl-child will reduce. “I could not have been so close to my children but now, I advocate for parents to be close to the girl child especially the fathers. Don’t become too busy for them. Don’t brush them away when they come to you. Plan and have time to be with them. Be their friends and provide for them to motivate them to be in school.” Aol urged the parents who attentively listened to her. She added that the high rate of girl-child school dropout is due to a lack of character development from home. She rebuked parents who abdicate their roles and take to drinking liquor or leisure after work with colleagues. Aol also suggested that parents give gifts to their children when they do well as a way of standing with them amidst challenges they undergo. She gave 23 mattresses to outstanding performers of the 2017 PLE result and cash prizes of 50,000/= for scholastic requirements to each of the selected pupils from sub counties and divisions within Gulu District. In 2017, Gulu District presented 2,236 candidates, 901 girls and 1,335 boys according to records from the District Education Office. 26 girls passed in Division one while 49 boys also passed in Division one with the best girl getting aggregate four. According to Gulu district leaders, the performance was poor compared to the previous years.